Neon lighting is completely on-trend! It’s an old craft which has been applied for many years. It is perfect as an eyecatcher in your store, or for example in the cafeteria of your company! 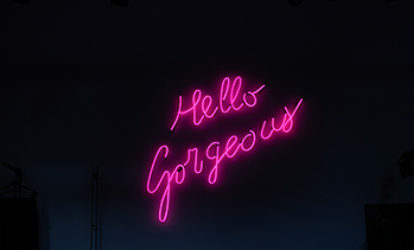 Neon lighting is a charming way to attach your brand or a nice quote or phrase on the wall! In addition to traditional NEON lighting, nowadays it’s also possible to choose so-called LED NEON. As the name suggests, with these lights we don’t use gasses to generate colour inside the glass tubes, we use LED lighting. Better is not the correct description, both traditional NEON and LED NEON each have their own qualities. Of course, LED NEON is newer and more economical, but not necessarily friendlier for the environment. NEON light advertisement is full of character, easy in maintenance, and 100% recyclable. Neon lighting is perfect to apply both indoor and outdoor! Neon lighting is not subject to wear caused by moist or temperatures. The options are huge, with regard to glass diameters, size and colour. This light advertising provides an ‘old’ look and feel, and any shape is possible! The technique that is used to get the neon in a certain colour is unique! It’s a tube with gas and electrodes. This lights up under power. We can create the tube in every desired colour and we can fill the gas in such a way that it radiates the desired colour. By mixing these and other gasses, various colour blends can be created. Neon lighting is making a complete comeback! You often see this application in stores in the form of a quote, fun phrase or for example a flamingo, a palm tree or a logo. You also often see neon lighting as facade advertising, company name and logo. Due to the many colours and forms that are possible, you make sure you really stand out! Are you interested in neon lighting? We have over 30 years’ experience in light advertising and neon lighting is our speciality. Let us know and we would be happy to share our thoughts with you!